The Genji crest on the cloak of the young man indicates a relationship to literature – the Genji-monogatari. It could also be an allusion to the life of Minamoto no Yoritomo. In a rare example from Harunobu’s work, space plays a dominant role in this design, since the landscape that has been drawn in as a picture of Fuji on the screen, makes the figures appear as if they were standing outdoors. A young courtesan tries to delay her lover as he takes leave of her. In the background is a folding screen decorated with view of Mt. Fuji. Like so many young men in Harunobu’s prints, this youth bears a crest on his cloak similar to the emblems for the Tale of Genji, but whether an allusion to the Heian romance is intentional or not is difficult to say. The tobacco box in the foreground is decorated with two plum or cherry blossoms, the insignia of the courtesan’s establishment. Another earlier impression of the print, before the breaks on the lowest edge of the folded bedding on the left, is reproduced in J. Hillier, Suzuki Harunobu, Philadelphia Museum of Art, no. 113. 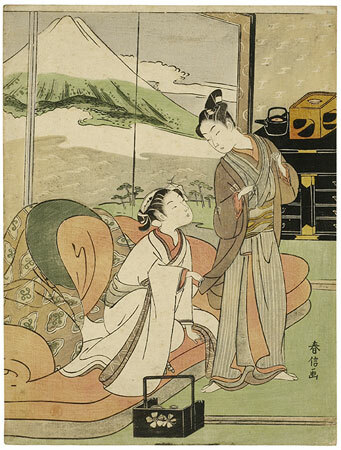 Keiko Mizushima has made the ingenious suggestion that this print may be a mitate, or an allusion, to en episode in the life of Minamoto no Yoritomo. She reasons that Mt. Fuji, which is especially conspicuous in the print, is closely associated with three legendary historical figures: Ariwara no Narihira, the priest Saigyō, and Yoritomo. Narihira is invariably shown riding past Fuji on horseback on his azuma kudari, or Eastern Journey. Saigyō is shown looking up at the mountain, but invariably alone and in a priest’s black robes. Yoritomo is usually shown hunting on the slopes of Mount Fuji, but as Ms. Mizushima points out, there were other stories about early love affairs that Harunobu could be drawing on, using the mountain as a backdrop for association. Her argument is strengthened by the decorative identifying crest on the young man’s sleeve and shoulder. It is of a type known as the Genji mon, 54 distinct symbols representing chapters of the Tale of Genji. These symbols appear on many young men in Harunobu’s prints, but never in reference to particular chapters in the Heian romance: they bear a certain generic similarity, but are not exactly similar to any of them. Harunobu knew the Genji mon and used them on a group of two or three prints which were explicit references to the Tale of Genji, so he was not misdrawing the crests on his young men out of ignorance. Rather, it seems likely that since Yoritomo was a member the Genji clan, Harunobu was using a “Genji” crest to indirectly identify him. Yoritomo had a special interest to the Edo public because he had brought the military government to Kamakura from Kyōto, lifting the Edo area into sudden prominence. It is possible that Harunobu had a particular fancy for the Minamoto clan, and that further study will show that other prints with young men wearing the not-quite-identifiable Genji mon are allude to episodes in their picturesque history.